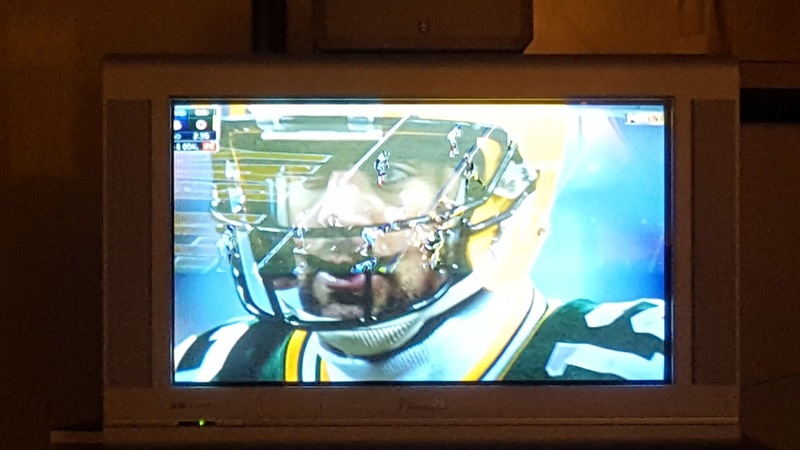 This afternoon I will sit down and watch another Playoff Packer game - one of my favorite winter pleasures, especially if they play well and win. It's what I will be watching it on that is a little funny. If you know my family, you know that TV is not a high priority. It's barely a thing, actually. I remember when HD flat screens came out, and I'm not talking the kind that you hang on your wall, I'm talking about tube TV's that had a flat screen instead of curved. Well, we had an old 25" Magnavox that had a curved screen and we were VERY late to the party in upgrading to the flat screen HD TV that we currently still use. We tend to drag our feet on upgrades around here until something breaks, especially something that we don't use much. So we bought our 300 LB tube-based HDTV in part because our in-laws had the same model and we loved the picture. At the time it was the waning technology with "hang on your wall" thin TV's on the cusp of getting big. We bought it and a surround sound system to go with it. We loved the setup, but did not like the cable bill we were burdened with every month. We fixed that by cutting the cord - so to speak. It was interesting to see how much our TV viewing dropped off when we were left with just network TV. I can comfortably say that after today's football games, the TV might not get turned on until next Sunday when the next games are on. It's how we roll. The commercials kill me and it seems they come on about every 6 minutes and who needs that? Well, all the while I was laughing to myself a little because here is my setup. This is augmented by a Yamaha entertainment center, also from 2001 has a 5 channel speaker system OF WHICH only 2 channels still work (Center and one rear speaker). This entertainment system also is rigged so that to play the sound through the TV you need to put the input mode to Aux2 and the TV sound needs to be turned down because it creates a nauseating echo effect. This adjustment requires two different remotes and an MIT technical student to figure out the few times we use it. We have a Roku box that is the coolest thing since the invention of the cell phone, but during the move of the TV from one spot to another, the HDMI cable got ripped out of the port for the TV thereby making it not work. Sigh. So now, the Roku box requires that the TV input be set to AV2 and the receiver to be set to oh, I don't know, Alpha Bravo Niner, I think. If you want to listen to FM, the antenna for that is laying on the floor and the reception is bad, so go read a book or something. And if you want to watch a DVD, well, it's probably easier to just use your dang laptop. 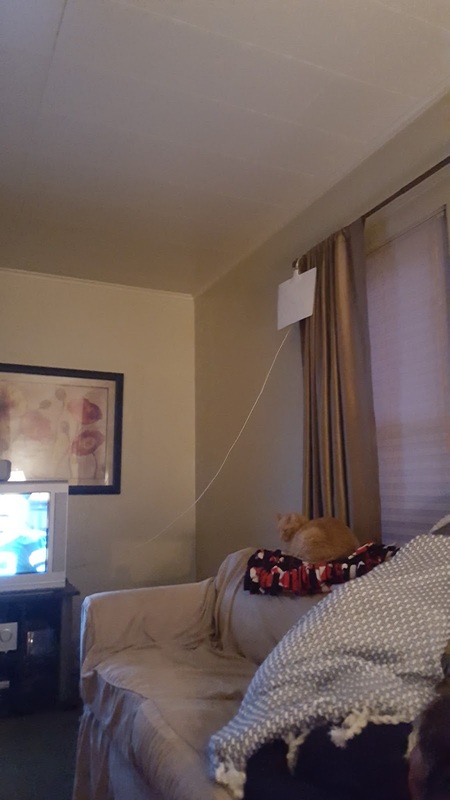 Because we cut the cable cord, we now use a Leaf antenna. This is a great little device but only when you hang it in a most prominent place. It doesn't do well behind pictures or on the floor behind a couch. Ours is hung from a curtain rod, because we like to keep it classy. Don't judge and don't be jealous. Besides, my cable bill last month was...oh wait, there was none. So you're probably thinking, boy, I sure wish the Landwehr's would invite us over for the game sometime, right? Well, you know you're always welcome. Just don't get in the way of the Leaf antenna and be prepared to sit in our new experience know as "not-all-the-way-around-sound." Go Packers and pass the chips!